I decided to check this anime out after reading the description as it mentioned zombies. The only other anime I have seen featuring a zombie apocalypse is High School of the Dead, which is really good but has a mature tone to it for those of you who don't know, so I'll only recommend it to older readers. But this one plays with your mind at the end of episode 1, even though it's portrayed as a bubbly anime most of the time. School-Live! (Japanese; Gakkou Gurashi!) is about four girls who have joined the School Living Club, one of which is Takeya Yuki. She loves school and everything about it, especially her school club activities which requires her to sleep in school too. The President of the club is Rii, and the other two members are Kurumi and Mi. They are accompanied by Megumi Sakura, one of the teachers and student faculty advisor. One day the club's dog Taroumaru runs off, causing Yuki and Mi to go around the school to find him. He's so cute! But here's where the mind playing/messing happens: Yuki goes into the classroom to get her backpack after she's told to do her homework and talks to some of her classmates about the incident with Taroumaru. But when Mi comes to see if everything is alright, we see that things are definitely not as they seem. Yuki thinks she's talking to classmates, but Mi sees only a choker of one the girls, broken glass and tables - the school is in a mess and zombies are everywhere! It doesn't seem like Rii and Kurumi see them either until you watch episode 2. There are hints that something has happened throughout the first episode, which I wasn't aware of until I read some comments, but after watching that I have no idea which is true. What's more, the end credits show Mi, Rii and Kurumi smiling at Yuki, but when we see her smiling at them, no one is there. The characters are a fun mix with Yuki being the happy-go-lucky kind of girl who reminds me of Yachiru from Bleach (the pink hair adds to it), and someone who absolutely loves being at school. Kurumi is like Kagami from Lucky Star, Rii reminds me of Unohana from Bleach, and Mi is kind of like Kirie from Himouto! Umaru chan and doesn't seem to be liked by Taroumaru. Those moments where she tries to talk to him are adorable, even when he's scared at one point. 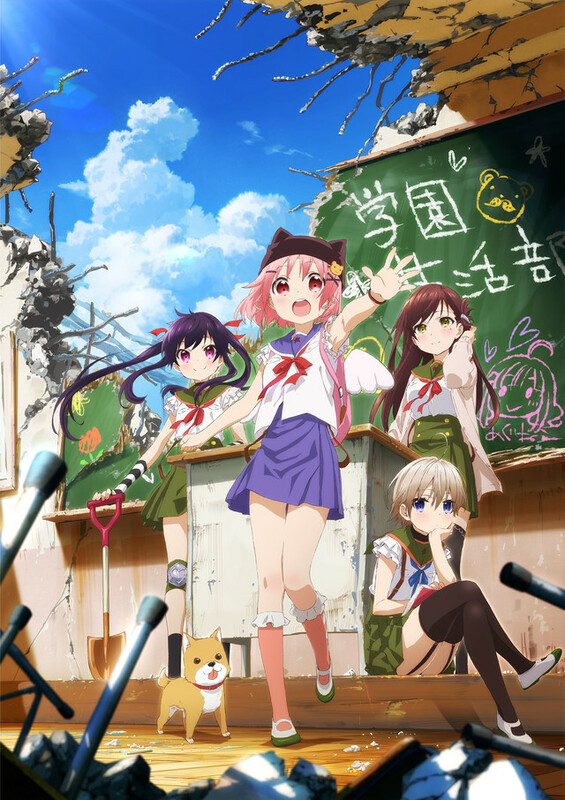 School-Live! is a really good anime with a twist - it seems lighthearted and bubbly most of the time, yet plays with your mind at the same time by bringing in the darker tone to the extent that you don't know whose view you believe. But it doesn't just stop there as the opening and ending songs are also lighthearted and bubbly with a twist.